The Northern Gateway toll road is the 7.5km extension of Auckland’s northern motorway. 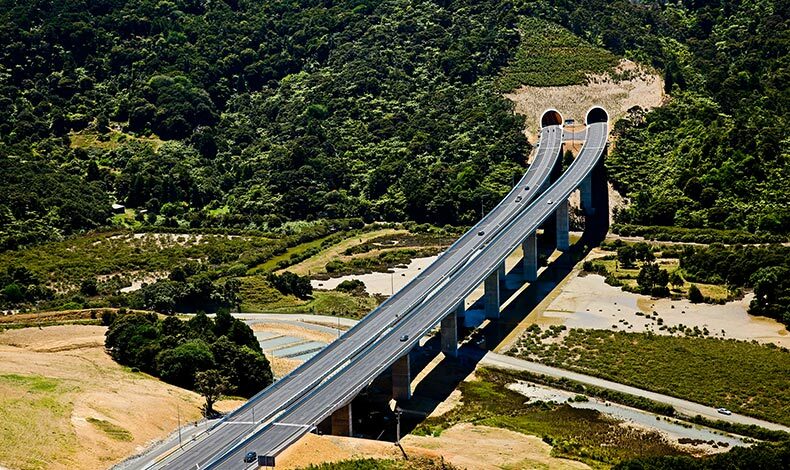 Completed in January 2009, it was Transit New Zealand’s largest-ever capital project ($365 million budget). A consortium, called the Northern Gateway Alliance, was responsible for the road’s project management, design and construction. The consortium, formed in 2004 to design and construct the road, comprised Transit New Zealand (now the New Zealand Transport Agency), Fulton Hogan, Leighton Contractors, URS New Zealand, Tonkin & Taylor, and Boffa Miskell. We contributed urban and landscape design, ecological and landscape restoration, and environmental management services to the Alliance. We were also represented on the executive management team and board. Our involved has been from project inception, providing ecological assessments and advice during early feasibility, route alignment and designation studies and, again, during the notice of requirement and resource consent process completed in 2001. We then provided environmental management and landscape design services during the design and construction phases. daily input to construction management including site supervision to ensure good environmental practice in the field. The project is acknowledged for having set new benchmarks in environmental performance for the construction industry – a notable achievement, given that the route traversed important landscapes and ecologically sensitive environments. Environmental management, urban and landscape design, ecological and landscape rehabilitation, compliance monitoring. Awards 2010, New Zealand Engineering Awards, Transportation Infrastructure category. 2009, Concrete³ Sustainability Award, Cement and Concrete Association of New Zealand. 2009, Arthur Mead Award for the Environment and Sustainability, Institute of Professional Engineers New Zealand (IPENZ). 2008, Sustainability Award for Excellence, New Zealand Institute of Landscape Architects (NZILA), Pride of Place Landscape Awards. 2008, Silver Award in Landscape Design in the Commercial / Industrial / Institutional category, New Zealand Institute of Landscape Architects (NZILA), Pride of Place Landscape Awards. 2008, Best Practice (Environmental Sustainability) Award, Roading New Zealand Excellence Awards. 2007, Supreme Environmental Award for projects over $10 million in value, New Zealand Contractors Federation awards.